Change machines in today’s market are now being used in wide variety of different market sectors. Even though the use of cash and change is slowly diminishing, many places and machines still require the use of coins. As we know it, the world is eventually going to evolve into a cash-less society but still to this day a lot of places require the use of change machines to function. Many places such as amusement parks, car parks, casinos, airports and many more. The 32-bit CPU provides functions which are present only in the change machines of higher quality, such as importing/exporting configuration parameters, exporting accounting data and the useful function of machine cloning. The reinforced closing mechanisms make it one of the most secure change machines in the market with regards to attempts of tampering and fraud. The Multicoin change machine with two hoppers with extensions can reach a coin capacity of up to 11,000 €1 coins. The graphic label can be customised to increase the visibility of a specific company log that can displayed on it. 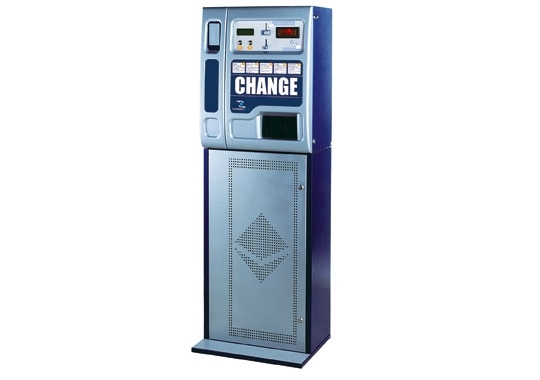 For more information on this change machine, follow the link below.